Dragonfly is the common name for any insect belonging to the infraorder (or suborder) Anisoptera of the order Odonata, characterized by an elongated body, large multifaceted eyes, and two pairs of strong transparent wings, which at rest are typically held out to the side or out and downward. In a broader sense, "dragonfly" is used to designate any insect in Epiprocata (Bechly 1996), which is a relatively new suborder that was created and subsumes as an infraorder of the previous suborder Anisoptera, the "true dragonflies." The word dragonfly is also sometimes used to refer to all Odonata. 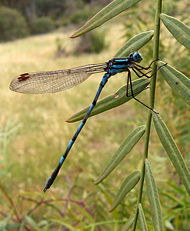 The term odonate has been coined to provide an English name for the group as a whole, while the term "true dragonfly" may be used in reference to just the Anisoptera. Dragonflies provide important values for the ecosystem and for humans. Ecologically, they are key to food chains, and as voracious aquatic predators, and also as terrestrial predators, and so help to control insect populations. They also serve as indicators of ecosystem quality. For humans, they add to the wonder of nature, and even are a minor food source in some cultures. As with all members of the arthropod class Insecta, dragonflies have three pairs of jointed appendages, exposed mouth parts, an exoskeleton, a segmented abdomen that lacks any legs or wings, and one pair of antennae on the head. Odonata is an order of insects encompassing dragonflies and damselflies, with members characterized by large, compound eyes, chewing mouth parts, a long and slender abdomen, and multi-veined wings that are typically clear or transparent. Members of Odonata characteristically have large rounded heads, legs that facilitate catching prey (other insects) in flight, two pairs of long, transparent wings that move independently, and elongated, ten-segmented abdomens. 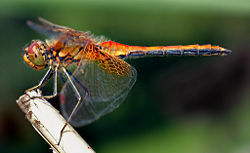 In most families of Odonata, the wings, which are large, multi-veined, and slender, have an opaque structure on the leading edge near the tip of the wing, called the pterostigma. Males have unique secondary genitalia on the underside of the second and third abdominal segments, which are distinct from the actual genital opening located near the tip of the abdomen (Grzimek et al. 2004). Within odonata, the two main groups are the damselflies (suborder Zygoptera) and the dragonflies (suborder Epiprocta), with true dragonflies in infraorder Anisoptera. Dragonflies tend to be large insects with four elongate, membranous wings with characteristic, net-like veins. The antennae tend to be very small. Dragonflies are predatory insects and typically eat mosquitoes, midges, and other small insects, like flies, bees, and butterflies. 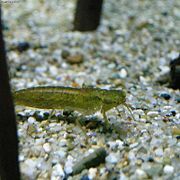 They are usually found around lakes, ponds, streams, and wetlands because their larvae, known as "nymphs," are aquatic. Dragonflies are valued as a predator that helps control the populations of harmful insects, such as mosquitoes. It is because of this that dragonflies are sometimes called "mosquito hawks" in North America. Although generally fairly similar, dragonflies differ from damselflies (suborder Zygotpera) in several, easily recognizable traits. Dragonflies have fairly robust bodies, are strong fliers, and at rest hold their wings either out to the side or out and downward (or even somewhat forward). Damselflies tend to be less robust, even appearing rather weak in flight, and when at rest hold their wings either folded together back above the abdomen or held slightly open above (such as in the family Lestidae). Also, the hind wing of the dragonfly broadens near the base, caudal to the connecting point at the body, while the hind wing of the damselfly is essentially similar to the fore wing. Dragonfly eyes typically occupy much of the animal's head, touching (or nearly touching) each other across the face, with notable exceptions to this being in the Petaluridae (Petaltails) and the Gomphidae (Clubtails). In damselflies, there is typically a gap between the eyes. Both are members of the Odonata, making their life cycles similar. Dragonflies undergo incomplete metamorphosis. Incomplete metamorphosis, also called hemimetabolism, simple metamorphosis, gradual metamorphosis, or hemimetaboly, is a term applied to those processes in which the larvae resembles the adults somewhat, as they have compound eyes, developed legs, and wing stubs visible on the outside, but the juvenile forms are smaller and, if the adult has wings, lack wings. In this mode of development, there are three distinct stages: The egg, nymph, and the adult stage, or imago. These groups go through gradual changes; there is no pupal stage. In hemimetabolism, the development of larva often proceeds in repeated stages of growth and ecdysis (molting); these stages are called instars. Female dragonflies lay eggs in or near water, often in, or on, floating or emergent plants. Some species, when laying eggs, will submerge themselves completely just to lay their eggs in a suitable place. Most of the life of the dragonfly is spent in the larval (naiad, aka nymph) form, beneath the water surface, using internal gills to breathe, and using extendable jaws to catch other invertebrates, or even vertebrates such as tadpoles and fish. 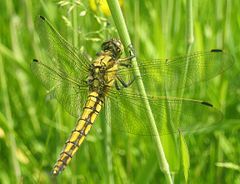 The larvae of large dragonflies may live as long as five years; in smaller species the range is typically between two months to three years. When the the larva is ready to metamorphose into an adult, it climbs up a reed or other emergent plant at night, and when it does, the breathing pattern changes inside the larva's body. Then the skin splits at a weak spot behind the head and the adult dragonfly crawls out of its old larval skin, waits for the sun to rise, pumps up its wings, and flies off to feed on midges and flies. In the adult stage, larger species of dragonfly can live as long as four months. Conventionally, the Anisoptera were given suborder rank beside the "ancient dragonflies," Anisozygoptera (two living species and numerous fossil ones), but it has been accepted recently that the Anisozygoptera form a paraphyletic assemblage of primitive relatives of the Anisoptera. Thus, the Anisoptera are reduced to an infraorder, forming the new suborder Epiprocta (dragonflies in a general sense). The artificial grouping Anisozygoptera was disbanded, its members being recognized as largely extinct offshoots at various stages of dragonfly evolution. The oldest known species of dragonfly is the 320 million year old Delitzschala bitterfeldensis. Another old genus is Namurotypus. In Europe, dragonflies have often been viewed as sinister. Some English vernacular names, such as "devil's needle" and "ear cutter," reflect such a link with evil or injury (Corbet 1999). A Romanian folk tale says that the dragonfly was once a horse possessed by the devil, and Swedish folklore holds that the devil uses dragonflies to weigh people's souls (Mitchell and Lasswell 2005). Another Swedish legend holds that trolls use the dragonflies as spindles when weaving their clothes (hence the Swedish word for dragonfly trollslända, lit. "troll's spindle") as well as sending them to poke out the eyes of their enemies. The Norwegian name for dragonflies is "Øyenstikker," which literally means "eye poker." Dragonflies are often associated with snakes, as in the Welsh name gwas-y-neidr, "adder's servant" (Corbet 1999). The Southern United States term "snake doctor" refers to a folk belief that dragonflies follow snakes around and stitch them back together if they are injured (Wayland 1973). The Lithuanian word "Laumžirgis" is a composite word meaning "the Lauma's horse," while in Dutch, Aeshna mixta is called "Paardenbijter" or "horse biter." In some South American countries, dragonflies are also called matacaballo (horse killer), or caballito del diablo (devil's horse), since they were perceived as harmful, some species being quite large for an insect. For some Native American tribes, dragonflies represent swiftness and activity, and for the Navajo they symbolize pure water. Dragonflies are a common motif in Zuni pottery; stylized as a double-barred cross, they appear in Hopi rock art and on Pueblo necklaces (Mitchell and Lasswell 2005). It is said in some Native American beliefs that dragonflies are a symbol of renewal after a time of great hardship. In Japan, dragonflies have been used as symbols of courage, strength, and happiness, and they often appear in art and literature, especially haiku. In ancient mythology, Japan was known as Akitsushima, which means "Land of the Dragonflies." The love for dragonflies is reflected by the fact that there are traditional names for almost all of the 200 species of dragonflies found in and around Japan (Waldbauer 1998). Japanese children catch large dragonflies as a game, using a hair with a small pebble tied to each end, which they throw into the air. The dragonfly mistakes the pebbles for prey, gets tangled in the hair, and is dragged to the ground by the weight (Mitchell and Lasswell, 2005, p. 38). Dragonflies also have traditional uses as medicine in Japan and China. In some parts of the world, they are a food source, eaten either as adults or larvae; in Indonesia, for example, they are caught on poles made sticky with birdlime, then fried in oil as a delicacy (Corbet 1999). Images of dragonflies were common in Art Nouveau, especially in jewelry designs (Moonan 1999). They have also been used as a decorative motif on fabrics and home furnishings (Large 1999). Large, E. 1999. The latest buzz: In the world of design, dragonflies are flying high. The Sun (Baltimore, MD) June 27, 1999, p. 6N. Moonan, W. 1999. Dragonflies shimmering as jewelry. New York Times August 13, 1999. Page E2:38. Rehn, A. C. 2003. Phylogenetic analysis of higher-level relationships of Odonata. Systematic Entomology 28(2): 181-240. Retrieved December 15, 2007. Wayland, D. H. 1973. From idea to word: Folk beliefs and customs underlying folk speech. American Speech 48(1/2): 67-76. Retrieved December 15, 2007. Odonata - Tree of Life. Dragonflies of North America - diagnostic photos and information - cirrusimage.com. Identification key to dragonflies found in Ireland - habitas.org.uk. Photos of most British species. Photos of South African species by Greg Lasley.